Wetlands are a natural solution to climate change yet they are disappearing at an alarming rate (World Wetlands Day, 2019). How can we harness the natural power of wetlands to help manage climate change? This is the key focus for World Wetlands Day, 2019. Landscape aesthetics can play a significant role in the public perception of ecosystems and natural spaces which are valued for conservation, recreation and importance (Everard & McInnes, 2016). Certainly, when it comes to wetlands, there are traditionally negative associations such as ‘wastelands’, places which are dirty or smelly or pest-ridden and even ‘spooky’ thanks to some horror movies (Wyant, 2019). As a consequence, wetlands have had a low value assigned to them and have been destroyed, infilled, polluted and degraded (Wyant, 2019). Side note: What is a wetland? Wetlands are areas in the landscape defined by the presence of water which inundates the soil either seasonally or permanently. This water can be static, flowing, still, fresh, brackish or saline. Types of wetlands include streams, creeks, lakes, marshes, peatlands, pools, swamps, mangroves, coral reefs or artificial water bodies. 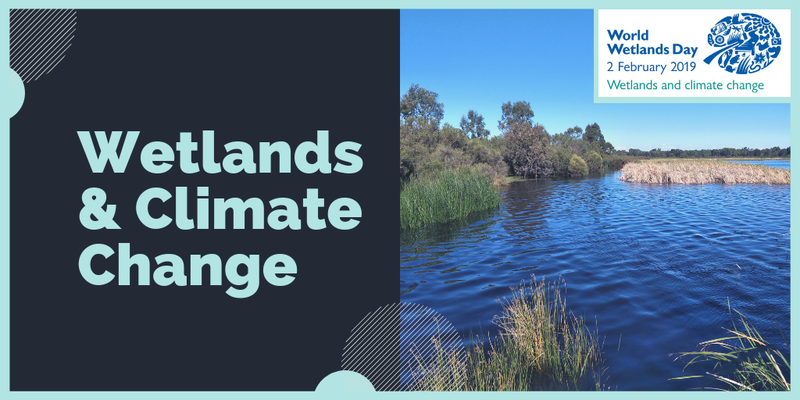 (Queensland Government, 2019; The Wetlands Initiative, 2019). In reality, wetlands deserve a lot more respect than they’re given. As one of the most undervalued ecosystems, they provide a huge range of services for different species (including humans). Habitat – for many aquatic and terrestrial plants and animals, especially as breeding habitats and food sources for migratory bird species. Flood protection – wetlands can absorb water and rainfall or act as a barrier to tidal surges, helping to prevent flood events. Clean Water – nature’s way of filtering water, removing pollutants and other nasties before water enters the groundwater system to potentially become drinking water. Recreation – supporting a range of leisure activities like canoeing, fishing, bird watching, picnicking. Cultural value – to Aboriginal people relating to stories and ceremonial activities. Wetlands also play a fundamental role in managing carbon and can play a natural role in managing climate change. It is estimated that 20–30% of the Earth’s soil pool of carbon is stored in wetlands, yet wetlands only contribute to 5–8% of the land’s surface (Mitsch, 2013). Due to the anoxic wet conditions, wetlands have the ability to store carbon from the atmosphere (Mitsch, 2013). 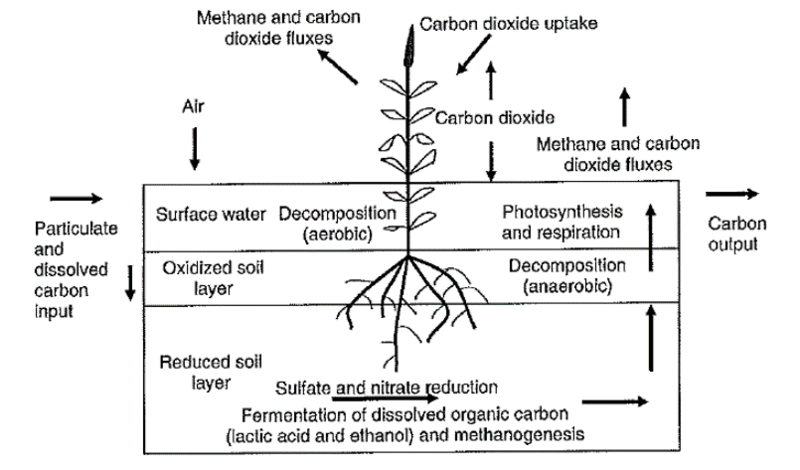 The carbon cycle in wetlands is complex but through photosynthesis of plants, the accumulation of organic matter in soils and sediments with the slow decomposition rates – wetlands can become natural carbons sinks (DoEE, 2012). Wetlands are the most effective carbon sinks on Earth and play a vital role in the carbon cycle and for storing excess carbon in the atmosphere (DoEE, 2012). When wetlands are degraded, burned and drained they lose this ability to store carbon and instead become a source of carbon and methane both primary gases which contribute to global climate change (World Wetlands Day, 2019). The level of carbon dioxide in the atmosphere has increased by 40% since pre-industrial times (World Wetlands Day, 2019). 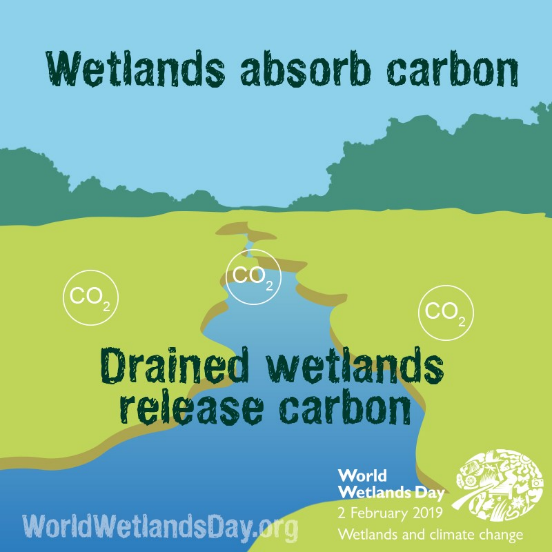 To reduce the impacts of climate change we need to stabilise and reduce greenhouse gas emissions, including carbon (World Wetlands Day, 2019). One strategy that can address carbon and emission management is the utilisation of the natural powers of wetlands. By protecting, restoring and rehabilitating wetlands we can begin to manage our emissions and reduce the serious impacts of climate change on us and the natural world. So take the time on the 2nd of February (or any day actually) to visit a wetland near you to appreciate the value it brings. See if you can help out by collecting rubbish, joining a local group that is working to protect the wetland or write to your local council or State Member to ask them what they are doing to protect or enhance the valuable treasures. DoEE. (2012). 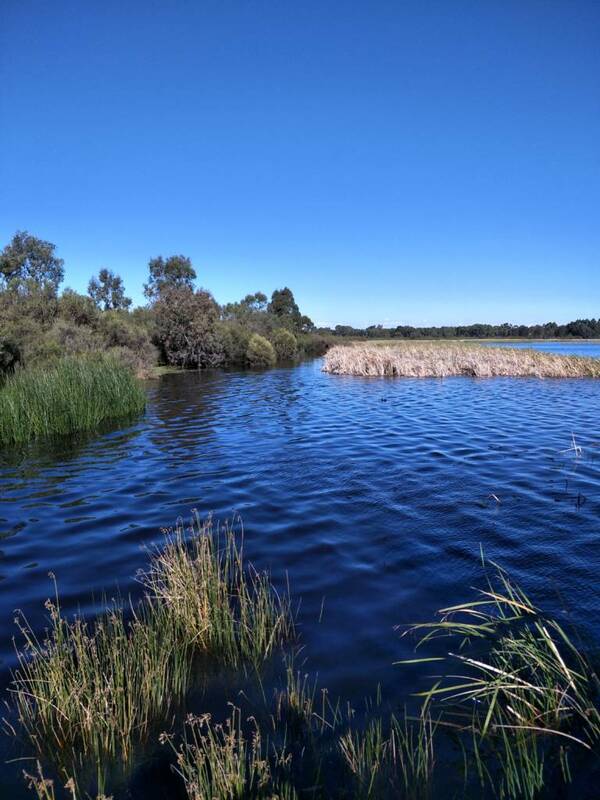 Issues Paper – The Role of Wetlands in the Carbon Cycle. Canberra, Australia: Australian Government. Department of Sustainability, Environment, Water, Population and Communities. Everard, M., & McInnes, R. (2016). Landscape Aesthetics and Wetlands. In C. Finlayson, The Wetland Book. Springer, Dordrecht. Mitsch, W. (2013). Wetlands, carbon, and climate change. Landscape Ecol, 583-597.